Vitamin B12 is one of the greatest nutritional concerns for vegetarians and vegans, because vitamin B12 is generally found only in animal foods. If you’re concerned that you may not be getting enough B12, look for some of these foods. *May vary depending on product or brand. All nutritional information from USDA National Nutrient Database for Standard Reference or food manufacturer labeling. Do I need a VITAMIN B12 supplement? As with all dietary supplements, it’s important to discuss B12 supplementation with your healthcare provider, especially if you’re vegetarian or vegan. Your healthcare provider can help you determine how much (if any) supplementation is right for you. It’s important to consider that folate—typically high in vegetarian and vegan diets—can mask the presence of vitamin B12 deﬁciency. The preferred form of B12 supplements is cyanocobalamin. Generally speaking, if you’re vegan (meaning you don’t eat ANY animal products), B12 supplements are recommended at levels that meet 100% or more of the recommended daily allowance. In fact, the Vegetarian Nutrition Dietetic Practice Group suggests that vegans consume much higher levels of vitamin B12 (250mcg/day for adults) to compensate for poor absorption of supplements. Regardless of diet preference, the National Institutes of Health recommends that all adults over 50 years of age receive most of their vitamin B12 through supplements and fortiﬁed foods, due to impaired absorption that occurs during aging. For a more guided look at how to build healthy vegetarian meal plans, check out our Oldways 4-week Vegetarian & Vegan Diet Menu Plan, which will help you create satisfying, balanced, budget-friendly meals inspired by cuisines from diﬀerent cultures. 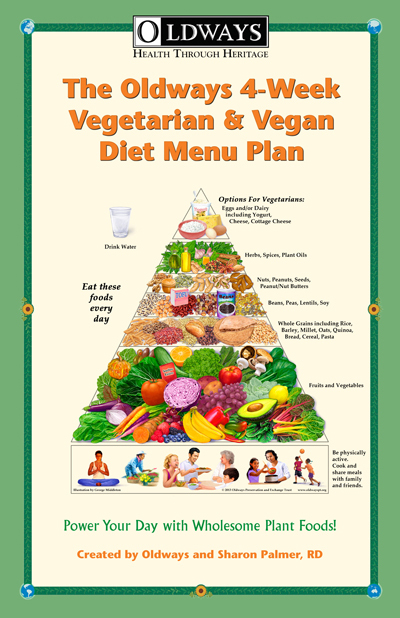 The recipes are based oﬀ of the Vegetarian & Vegan Diet Pyramid, and feature an abundance of delicious, healthy foods such as vegetables, fruits, nuts, seeds, whole grains, legumes, herbs, and spices. I had bariatric surgery in 2006. I am under doctor order to twice a day multivitamins, calcium and vitamin B12 supplement. I'm live WFPB since 2006. Lost over 200 pounds and need to know what produce I should be eating to stop taking these pills. Please help me! Hi Val, That is quite an impressive transformation! We're not doctors, so can't comment on what types of pills you should or shouldn't be taking. We highly recommend that you work with a physician and dietitian in your area to find an eating plan that works for you. However, as noted in the article above, B12 is often recommended for folks on a WFPB diet because it isn't found in produce or unfortified plant foods. Hi Val! First of all so proud of you! That is a MAJOR feat losing all that weight and committing to living a healthier lifestyle! The thing about bariatric surgery is that is can cause your stomach to produce less HCL. HCl is needed to separate B12 from protein that it is attached to when it is consumed from food. Your doctor (and FYI I am not a doctor) may have you on a supplement so you can absorb the B12 despite a lack of HCL. After bariatric surgery many people's ability to produce HCL declines. HCL is needed to separate B12 from protein, it is naturally attached to a protein when it is consumed in food, and it must be separated first to absorb it. A B12 supplement may have been prescribed to you so you can absorb it with a lack of HCL production. Val Morrison, Look up druglessdrs.com they are awesome at what they do and I'm sure the will have some answers for you. Thank you so much for this article, I am a vegetarian and I constantly have people telling me I'm going to drop dead if I'm not getting the right balance of vitamins, now I know I can get b12 without meat or animal products. Thank you thank you thank you! You're so welcome! We're so glad that you found this article helpful. looking for foodd for veg to increase vitamin b12 as I Indian style. Have been taking Trader Joe brand B12 sublingual tablets. Does anyone know if these are actually valid. Hi MJ, For advice on supplements, we suggest that you speak with your physician or dietitian. They might be able to offer additional insights or suggest specific brands. It is really obvious that begins and vegetarians don’t have a healthy lifestyle; may times people seem to do it just to be different or lose weight. If you have to supplement to be healthy, your diet is not healthy. I understand eating vegetarian meals every now and then, but not permanently. So many people have died and gotten sick because they are not educated about these diets. Please be careful to inform your readers that you can’t just start his diet without doing some research. Bruce, I appreciate your concern but really every one needs to look at sound nutrition advice. I am a successful vegan for 28 years. I exercise regularly and am known for my robust health and strength. I didn't choose this to be different, nor has anyone that I know who has chosen this. I think that accusation is unfair. Non-veggie folks are not necessarily more sound in their food choices. Believe me, being a health care provider for 40 years I have seen a marked rise in obesity and diseases related to unhealthy diets. I think promoting a way of eating that can promote health as well as the reduction of environmental stresses to the planet is completely appropriate and necessary. The tragedy surrounding avoidable serious health problems must be confronted head on and I believe organism is a quite reasonable option. Thank you for your time and best wishes to you! Hi Sonya; First of all thank you for your sevice. I have been on vegan dite and lifestayel for the last 8year. I eat mostl organic,wholefoods and never take any suppliments including B12. Even thought I am perfecly healthy, always full of energy and generally happy I sometime wonder if I should atlist take b12. I would appreciate if you could give me your personal opinion on taking supliments? Such as B12, iron. Do you take any supplement yourself? I understand its not a medical advise so feel free to give me all you got. :) because I am pro natural way all the way. Thanks. I love to see health care providers say out loud that food causes disease. Bad foods cause inflammation, and almost all disease is caused by inflammation. It's amazing the amount of doctors that basically say diets aren't that big of an issue. Do you have peer reviewed studies by chance? They seem to be just starting. Hi Don, you can check out studies related to inflammation at this link: https://oldwayspt.org/health-studies/search?keys=&field_health_factors_value%5B%5D=inflammation&items_per_page=12 Most of these studies are peer-reviewed; you can check the name of the journal and the link to the original study in the descriptions. Just to clear up something you said about supplementing your diet. All factory farmed meat is now supplemented with B vitamins. The use of herbicides and pesticides kills the naturally occurring vitamins in the soil. So farmers have now started to supplement their cows with b vitamins. Which means a non meat eater supplementing with b vitamins is getting a cleaner source than the actual meat eater. Your comment is misinforming / if properly educated about vegan/vegetarian nutrition, it is much healthier than a diet with animal source products. Keep learning ! Sorry if I missed it, but I don't see it listed what the recommended MCG of B12 is anywhere. Would it be very difficult to get all B12 through the items listed in the Vegetarian list (e.g., cream cheese, yogurt) + a few things from the Vegan list such as fortified almond milk? 2.4 mcg is the recommended amount. I have taken B6, B12 sublingual tablets from Tri-Vita and feel confident in the quality and integrity of this company. Bruce, I have been a healthy vegetarian for 47 years. As you know, many people who eat meat also take ill and die. In fact, we all do. Information about good nutrition is readily available to anyone who is interested. I hope that everyone, whatever their dietary choice, would take advantage of both that knowledge and the bounty of nutritious foods available in our markets. Mel and others, As long as you understand meat is a wonder food, all the rest is fluff. I admire your dedication to eating plants though- more meat for me! Thank you for such an informative article. I have been vegetarian for the past 30years haven't faced any major health challenges. Why however wondering if my diet won't give me challenges at around 50 ( am approaching that mark now) I am happy I now know how to improve my vitamin B12. I am sorry Bruce I think you harsh to the vegetarians. Some people actually become vegetarian after getting advice from physicians as a way of improving their health. Every diet has it's down side. We're glad you enjoyed the article! Hello sir I am obese person . I am pure vegetarian. I am 5 feet in height and my weight 66 mg. I am anemic and deficiency of B12. And I taking supplement. And I start exercise last week. I gaining wait not reducing. I am very worried about my health. Plz suggest me what is Good for me. We recommend that you speak with your doctor or a dietitian in your area to find an eating plan that works for you! The fortified foods with B12 is necessary because the natural source is from animal meat. Does that mean that vegan B12 is synthetic? The natural source of the bacteria that makes up vitamin b12 is dirt, which the animal consumes while eating plants. Except most animals do not eat many plants anymore so the animals are injected with b12. When you eat meat, you are getting b12 that has been injected into or consumed by and used by an animal. Supplements that vegans/vegetarians take are more bioavailable and are not acquired secondhand. I've been vegetarian for 40 years, I'm 65 and have been getting B12 shots from my doctor for the past 3 or 4 years. I do this not because I'm vegetarian, but because, with age people do not absorb B12 as well as before. Actually, with age there are many adjustments needed in one's diet and exercise program. Thanks for sharing your experience! I hope this helps give others an idea of how to discuss aging with their doctors. How did u get vitamin B12 before the shots? Where does the B12 come from that's in supplements and/or fortified foods? Cyanocobalamin is the most widely made B12 supplement forms, and it is made through bacterial fermentation or synthesized in vitro before it is crystallized. Fermentation is performed by a variety of microorganisms into a form of adenosylcobalamin, which is then converted to cyanocobalamin by adding potassium cyanide in the presence of sodium nitrate with heat. Most of it is made in France right now. Most of these supplements are marked “vegan” indicating that they are not made with animal sources. This is not the same form of B12 that is in animal foods. I've been vegetarian for the past 25 yrs and vegan for about 3 yrs. I can not digest dairy products and as result I gain weight. I have to take B-12 vitamin supplements and leafy green veg. juices. I have to tell you that I have never felt this good and energetic before. What is in the vit b12 in the supplemented foods? The B12 in supplemented foods is usually cyanocobalamin. It is made through bacterial fermentation or synthesized in vitro before it is crystallized. Fermentation is performed by a variety of microorganisms into a form of adenosylcobalamin, which is then converted to cyanocobalamin by adding potassium cyanide in the presence of sodium nitrate with heat. where can i find B12 in fruits? Unfortunately there is not a significant amount of B12 in fruits. B12 comes from animal foods. B12 sources typically come from animal foods and not vegetables. The charts in the blog post above may be helpful for finding sources of B12. Some examples include fortified almond milk, yogurt, milk, cheese and eggs. Are there any nuts, fruits, vegetables, or grains that are high in b12? Vitamin B12 is generally found in animal foods. The best plant-based food sources of B12 will be the fortified and dairy foods listed in the table in our blog post. So I have a question. In a pre-dominantly vegetarian culture such as India, how is b12 being supplemented in their diets? I do not think their dairy products are fortified. Is everyone taking pills?